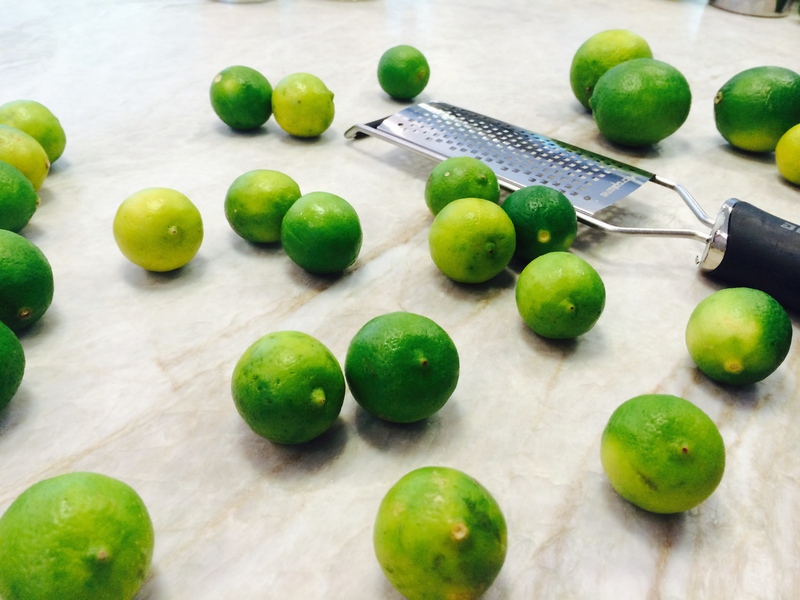 Key limes. Lots and lots of them. You see, I got this craving for key lime pie and didn’t exactly want to spend the hours waiting for pie crust to rest, so obviously I made it into ice cream. Super simple ice cream that doesn’t require making a custard beforehand, because we have already established how little patience I have. This is the most decadent, tart, and wonderful substitute for a slice of key lime pie. It may not be as good as the slice of heaven from Rick’s Dessert Diner in midtown Sacramento, but it’s close, and that’s just fine with me. My kitchen partner-in-crime trudged over to my house with electric ice cream maker in hand to aid in making this magnificent creation. 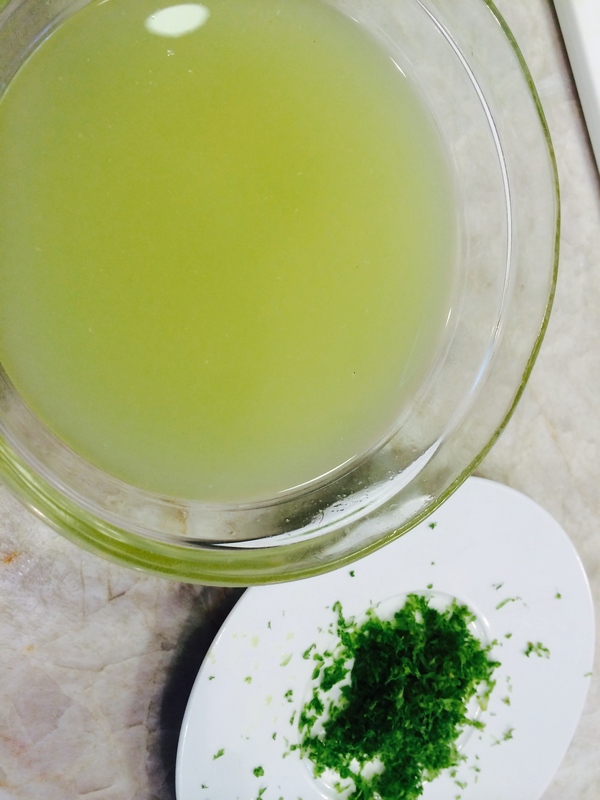 We zested each painfully small lime and then realized that juicing them gave us a measly drop of juice per half. By all means, feel free to use bottled key lime juice – I love Nellie & Joe’s Famous Key Lime Juice, if you want a short cut. This recipe already only takes about ten minutes of mixing the base before freezing, but the easier the better! 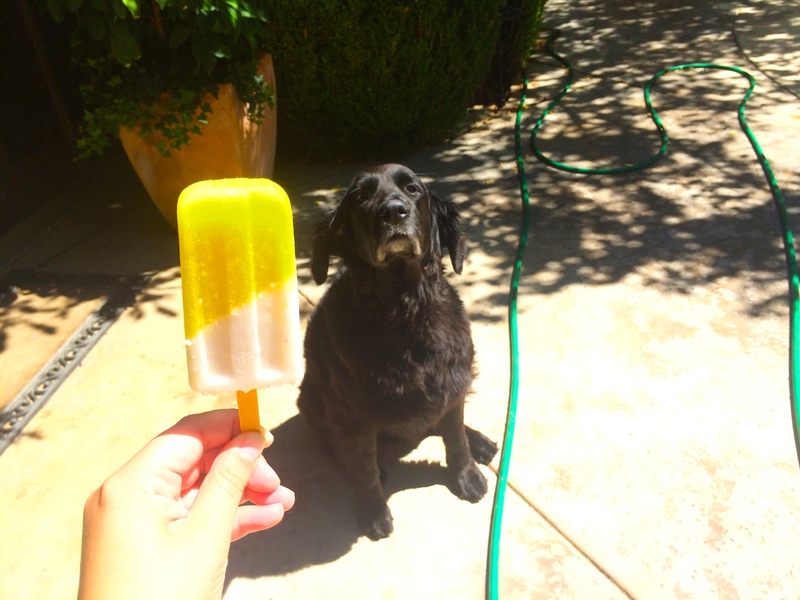 This recipe reminds me of the long summer we get in California, spent walking around with my pups. 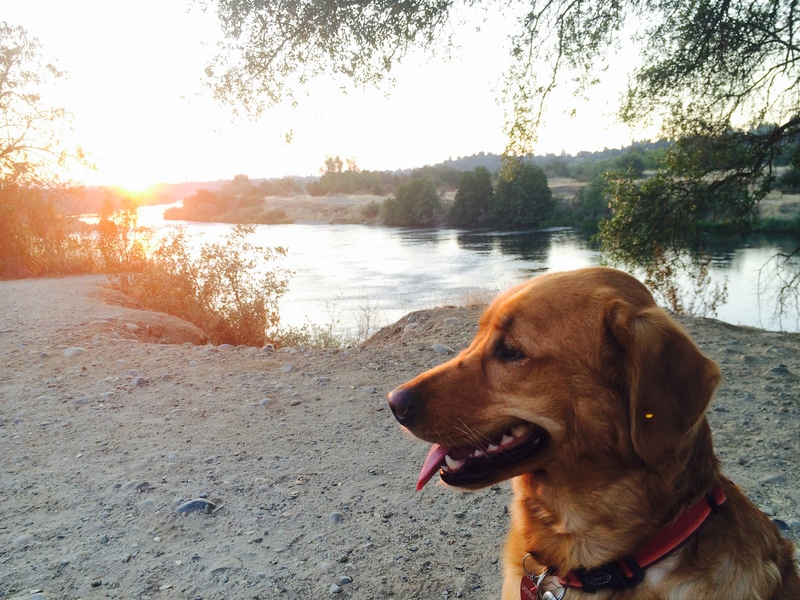 Ladybug sat patiently and modeled as I took in yet another incredible sunset on the American River. Night after night, it’s this incredible. This summer has been so relaxing, being able to spend it with family and adventuring around the country. I hope this recipe reminds you of something sweet and summery. If not, what reminds you of summer? What do you have left to cross of your summer bucket list? Let me know it the comments below! Mix condensed milk, cream and lime juice together in medium sized bowl. Add zest and mix thoroughly. (Note: you may need to double recipe if your freezer is larger than 4 Quarts). Make sure paddle is sat in groove before placing top on canister. I always use a layer of plastic wrap to make sure no rock salt ruins the ice cream mixture in the process. Layer ice and rock salt around canister and follow instructions on maker to freeze. If you’re using a hand crank mixer, when the handle gets hard to turn, the mixture is frozen. For the motorized freezers, make sure to listen to the motor so it does not overheat. Serve with a graham cracker for garnish & enjoy! Welcome to The Rambling Reed! After two years of debating and second guessing all that goes with starting a blog, I’ve finally gotten on with it! *Yay! You did it! * For those of you who know me, this has been something on the front of my mind for some time now. I’ll be filling this blog with simple recipes, travel adventures and whatever else comes my way. Three hours into the making of a one-hour recipe, I’ve discovered that photographing food is NOT the easiest thing (and my trusty helper can attest to this too). So, it turns out I’m an amateur chef, blogger, and photographer. This recipe is a staple that I’ve memorized over the years and is fairly simple to throw together for a quick gathering. It usually takes about one hour of active preparation and can be made the night before. Especially during the hot summers that Northern California gets, the cool filling and citrus-y mango is perfect for a night that just won’t cool down. I’ve made this recipe on several occasions; originally for a Father’s Day BBQ and then in New York while visiting my older sister and her friends. Useful at any gathering! Cream butter, sugar and salt together in medium sized bowl. Scrape mixture down using rubber spatula and beat in egg yolk and poppy seeds. Mix in flour until dough comes together into small clumps. Wrap in cling film and refrigerate for 2 hours (or 30 minutes in the freezer). Preheat oven to 350º F. Lightly dust surface with flour and roll dough out to ¼-½ inch thick round. Bake until the dough is lightly brown or golden in color, about 20 minutes. Let cool for 5 minutes before adding the filling. *Tip: When baking the crust, do not cut off prior to baking, as the the dough has a tendency to shrink. Trim excess after the dough has cooled. Peel and dice the mangoes into ½ inch cubes. 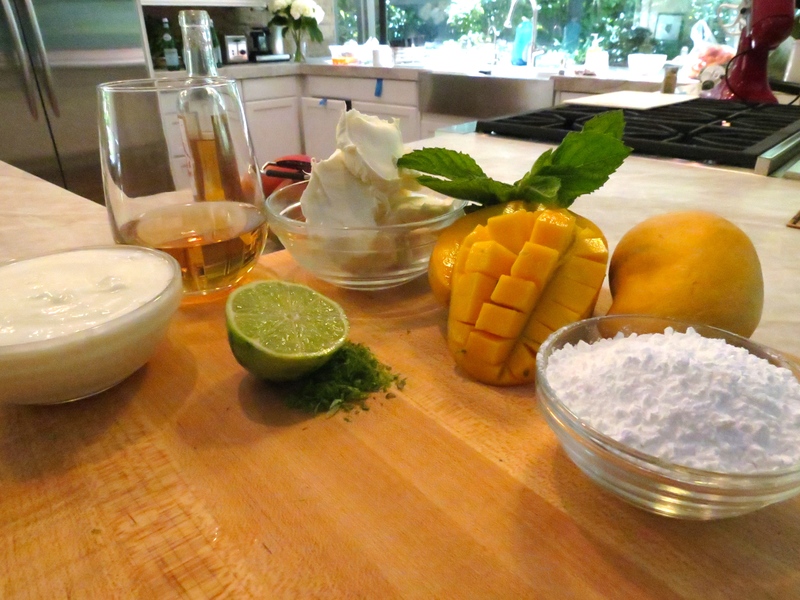 In a small bowl, combine the diced mangoes with the dessert wine to macerate for at least 20 minutes. 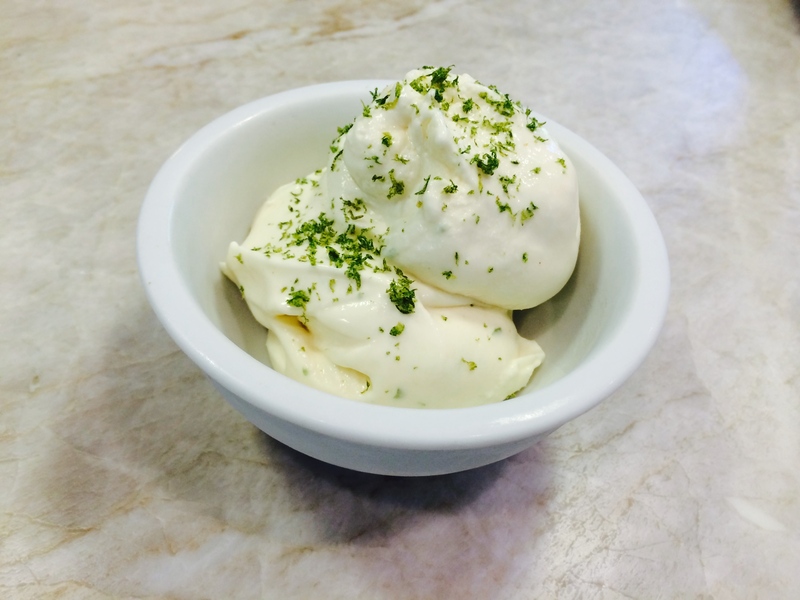 Beat together the mascarpone, yogurt, sugar, lime zest and juice into a smooth mixture. At this point, add 1 T of confectioners sugar for a sweeter filling, if so desired. Strain the mango mixture over a small saucepan and set aside mangoes. On medium heat, reduce the liquid until it reaches a syrupy consistency; add to the mascarpone-yogurt mixture. 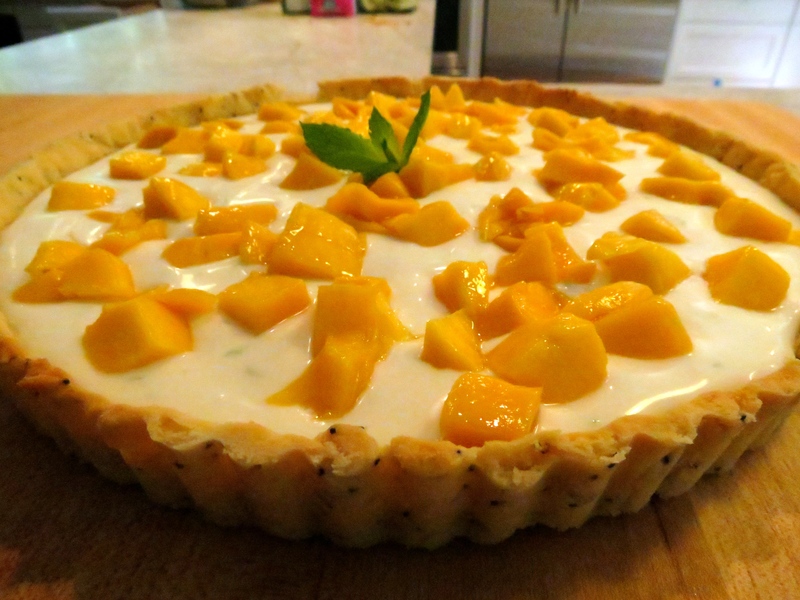 Assemble the tart by pouring the filling and smoothing. Lightly place the diced mangoes on top and garnish with mint. Serve chilled & enjoy!